The Saturday of the fifth week of Great Lent is called the Saturday of the Akathist in the Church’s Typikon. The word “akathist” in Greek literally means “not-sitting” or “not-sitting hymn,” that is, a hymn during which one is not supposed to sit. The akathist was written no later than the sixth century; a tradition exists that its author was St. Romanos the Melodist. 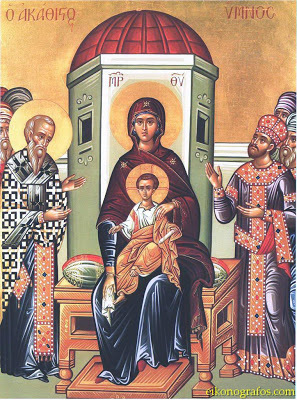 The Most Holy Theotokos is extolled in the akathist with the help of various metaphors, similes, and poetic images. The composition was written in Greek, and in the Greek original each of its lines corresponds rhythmically to the other lines; in many cases the endings of the verses rhyme. St. Romanos the Melodist, or another hymnographer whose name remains unknown to us, clothed the doctrine of the Most Holy Theotokos in entirely unique and very beautiful poetic form. People have been very fond of the akathist: over the centuries it has been read not only at divine services, but also during private prayer, both by monks and laymen.